A History of the Church and the building. When St James Chapel of Ease was built on land gifted by Joseph Wilson to the Ecclesiastical Commissioners in 1858, it consisted of the nave with apsidal chancel, spire porch and vestry. It was designed by Matthew Thompson of Newcastle upon Tyne, built by J D Thompson at a cost of approximately £900 and was consecrated by the Rt. Revd. The Bishop of Durham, Dr Langley on April 22nd, 1858. Within two decades, the nave was lengthened, the chancel made longer and enlarged with a new transept added at a cost exceeding £1,000. This extended building was re-opened for worship in August 1878. A new vestry appeal was launched by Revd. W. J.Hinkley in 1962 and this addition was dedicated by the Lord Bishop of Newcastle, the Rt. Revd. Hugh Ashdown on Sunday, 8th December 1963. 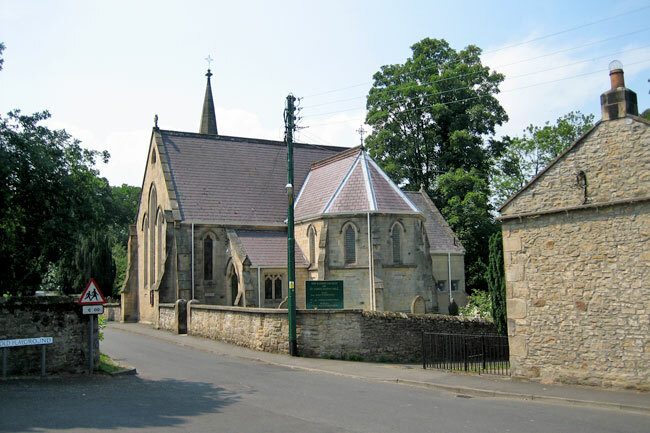 Until 1975 St James was a Chapel of Ease for St Andrew, Bywell and it was only when that church was made redundant, that St James became the Parish Church of Riding Mill. Behind the altar is a beautiful reredos made in 1900 by J Powell & Sons of London which was designed by Ada Carry. The five stained glass windows in the Sanctuary are by Shrigley & Hunt, the artist being Karl Almquist, whilst the small window in the South side of the chancel is by Waites of Newcastle, donated as were the altar rails and the East windows. “The light of the World” window in the South transept is by Atkinson of Newcastle, whilst the most recent window dedicated to St Luke was designed and made by Andrew Taylor in 2006. Powell & Sons made all the early 20th Century windows in the nave and E. Evett those in the Baptistry. These colourful memorials dedicated to those who have worshipped here in the past, lend a sense of calm and serenity to this well loved church, which is usually open between 9am and 5pm each day.